- AutoPeriodsDetect parameter was added: indicator is having auto-settings with H1 and smaller timeframe as 9/26/52, and for H2 and larger 72/144/288. So, no need to change anything in the settings concerning it. I am testing indicator it now. is there a latest version, would love to try this out? has v11, is that the latest? I will check it now (it should be the latest with no error ... but I will check). It works, but it keeps all the historical signals on the chart so the indicator need to be fixed in this case anyway. This advisor is an advisor assistant in manual trading. Powered by rebound from levels. The levels here are the horizontal line objects that the user draws manually on the chart. It is allowed to use one object for opening BUY positions and one for opening SELL positions. The main thing is that the names of the objects Horizontal lines correspond to the specified parameters HLine Buy Level name and HLine Sell Level name . 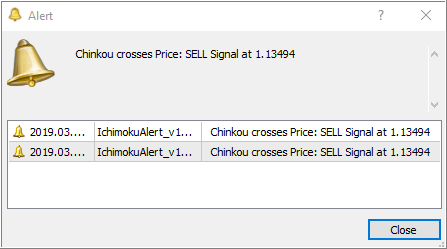 When the current price is higher than the HLine object , the Sell Level name is a signal to open a SELL position. At the same time move the object HLine Sell Level name ABOVE to HLine's Step pips. We act in a similar way when the current price is below theHLine Buy Level object . Name is a signal to open a BUY position. At the same time, we move the HLine object Buy Level LevelBELOW on HLine's Step pips.